Dzambala Incense Sticks are handmade from carefully harvested Himalayan herbs, oils, resins and spices in accordance with traditional scriptural methods and formulae. This spicy herbal incense is especially suitable for use in religious rituals and as an offering to the Buddha of Wealth, Dzambala. Dzambala Incense Sticks are handmade to meet the highest standards of quality, following a strict formula found in ancient traditional texts from a variety of medicinal herbs, oils, resins and spices from the Himalayan mountains. Prepared under the supervision of the eminent healing lama, H.E. 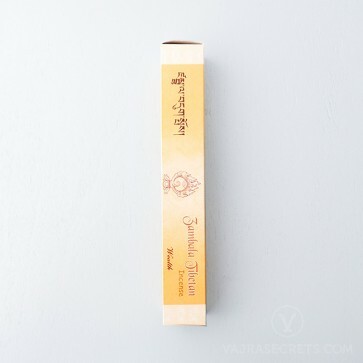 Gangchen Rinpoche, this spicy and aromatic herbal incense is especially suitable for use in religious rituals and as an offering to the Buddhas, particularly the Buddha of Wealth, Dzambala. Dzambala not only increases our wealth and fortune but helps us develop inner happiness through the wealth of spiritual understanding. This healing incense can also help restore harmony between the body and mind.